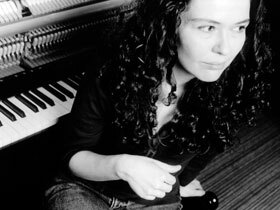 Sylvie Courvoisier is a pianist, composer, sideman and band leader. Born In Lausanne, Switzerland, Courvoisier moved to New York in 1998 and has lived in Brooklyn since that time. Mori, Erik Friedlander, Herb Robertson, Tim Berne, Susie Ibarra , Joelle Leandre among others. Since 1997, she performs regularly in solo and in Duo with Mark Feldman. She is a member of Mephista ; co-leads the Courvoisier/ Feldman Quartet and is the leader her own Trio with Kenny Wollesen and Drew Gress and her quintet “Lonelyville”. Since 2010, she has been working as a pianist and composer with the new project of the flamenco dancer Israel Galvan “la Curva”.